In the month of May, 2011 we started our first self-sufficiency project in the Philippines. 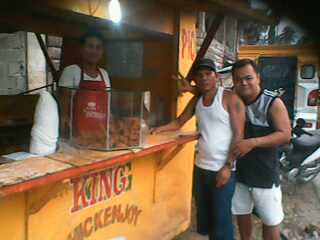 John Sarmen from Liannga, Mindanao submitted a business plan to Sonlight Ministries to operate a Fried Chicken stand in the City of Manila. The business will provide income to John as well as one additional job to a brother in the Lord in Manila’s church. A relative of John already operates one of these chicken stands and will provide the expertise in starting and operating this new venture. Sonlight Ministries made a loan of $900 to Brother John on May 23rd with a plan to repay the loan within 12 months. When the loan is repaid the funds will then be used to start an additional self-sufficiency project. We are currently looking into starting more self-sufficiency projects once we receive additional funds for these endeavors. We believe that funds for these projects have great potential. First, it will enable the local people to start and operate a business. The profits will supply monthly support for those who own the business as well as for those who will then be hired to run the business. There is very high unemployment in the Philippines and these self-sufficiency programs will provide opportunities with jobs and financial support for the families involved. Second, we have been teaching the brethren in the church the principles of tithes and offerings. Giving first fruits from these self-sufficiency projects back to God through the local churches will in turn bless and support the work of God in the Philippines.